Demographically, Italy is transforming faster than almost anywhere else in Europe. Last year, according to the Catholic charity Caritas, the percentage of noncitizen residents in the country  7.2%  was greater than Britain's. And that's not counting the country's illegal population, estimated at well over half a million. In a country where the native-born population is aging rapidly, 1 in 6 babies delivered in 2008 was born to a foreign-passport holder. La dolce vita is also becoming more dependent on immigrants and their labor. The International Organization for Migration (IOM) estimates that foreign workers account for 9% of Italy's annual GDP. They pick the fruit in the country's orchards, staff its restaurants and workshops, and look after its young and elderly. "If all the migrants just stopped working now, the Italian economic system would collapse," says IOM spokesman Flavio Di Giacomo. Yet the country retains an intensely prescriptive streak. Rigid codes of behavior govern everything from how to dress to the proper time of day to drink a cappuccino. Far from being a melting pot, Italy remains a three-course meal, with the pasta carefully segregated from the appetizer and main course and no place for a bowl of hummus or plate of egg rolls. "People now accept that immigrants are here," says Giuseppe Sciortino, a sociology professor at the University of Trento. "But they're still in denial that they are a presence that will change Italy forever." In some places, the denial is turning to anger. The violence in Rosarno erupted on Jan. 7 after two immigrants were shot by white men with pellet guns. The town's immigrants responded by burning cars and vandalizing shops, prompting retaliatory attacks by residents. "It's racism against blacks," says Yakuba Camara, a 25-year-old immigrant from Guinea, one of the clash's first victims. "I didn't do anything, and they shot me." By the end of the weekend, nearly 70 people  most of them migrant workers  had been injured. The Pope called for tolerance and the government evacuated about 1,000 immigrants to neighboring cities to ensure their safety. The region of Calabria, where Rosarno is located, makes up the toe of Italy's boot. Seasonal migrants  mostly from Africa and Eastern Europe  have long worked in the citrus orchards there. The hours are long and the wages often less than $30 a day. When Fabrizio Gatti, a journalist for Italian news weekly L'Espresso, posed as a migrant worker in 2006, he uncovered a world where beatings and exploitation were common. "You have no contract  no rights," Gatti says. "So if they don't pay you, you cannot go to the police." The international aid group Doctors Without Borders  best known for its work in war zones  considers the conditions so bad that it runs a clinic catering to workers who live in abandoned factories with no access to running water or health care. "This is a neglected population, and they are the victims of exploitation and violence," says Sophie Baylac, who coordinates the group's migrant programs in Europe. "The situation ... is a symptom of the ongoing neglect suffered by seasonal migrants." Despite that neglect, or perhaps because of it, immigration has become a hot-button issue in Italy. A poll last year found that 69% of the country considered immigration a top priority, more than twice the continental average. So far, the discussion has been monopolized by the anti-immigrant Northern League Party, which has ridden to electoral success by focusing on crowded boatloads of illegals and the links between foreigners and criminality. With the left largely silent, many voters see the Northern League's rhetoric as the only serious attempt to tackle the issue. "The fear of immigrants isn't something the League has instilled," says Giancarlo Giorgetti, a Northern League parliamentarian. "We are the mirror of the Italian society. It's the culture of this country that wants to close itself to the outside." 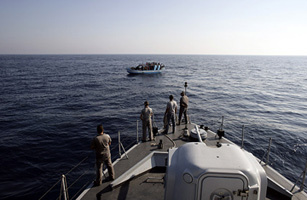 Last summer, the Italian government, in which the Northern League plays a central role, made irregular migration a finable crime and tripled the period  to six months  that immigrants can be detained before deportation. In January, it announced it would cap the number of foreign students in the country's schools and universities at 30%. See pictures of immigration in Europe.